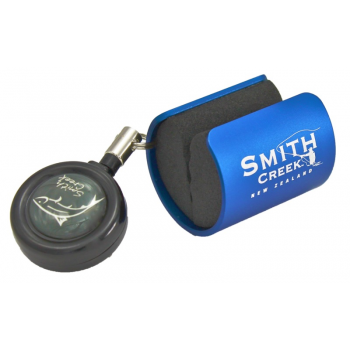 The Smith Creek Rod ClipTM is a wearable fishing rod holder that holds a fishing rod so that anglers hands are free to tie on a fly, changing a lure, bait a hook or show off that trophy fish they’ve just landed. It holds a rod securely and out of the way and it can’t be accidentally knocked free. Besides keeping grit out of a reel, the Rod ClipTM also keeps an outfit above the salt out of the mud, And finally, no more having to lay a rod on the ground while releasing a fish. 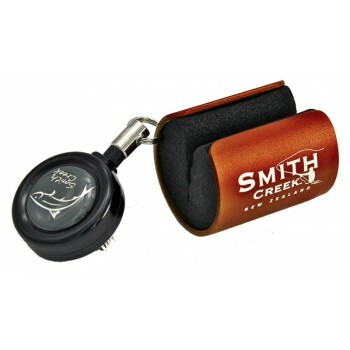 Rod ClipsTM are good for all types of fishing and work with most sizes of rods. Putting a rod in and out of the clip is an easy single- handed operation that becomes second nature on the first day. Rod ClipTM aren’t only for trout fishermen with a fly rod, bass, salmon / steelhead, spin and saltwater anglers will also love using them. They’re built Smith Creek-tough from anodized marine grade aluminum and the custom made zingers have been tested to over 50,000 pull cycles without failing. Even so, they’re compact, lightweight, and anglers don’t know they’re wearing it until they’re using it.